20 years of Quintessenz – an occasion to celebrate. And not only for the fabulous Leipzig flute ensemble, but first and foremost for their audience, who eagerly await every one of their new programs and CDs. 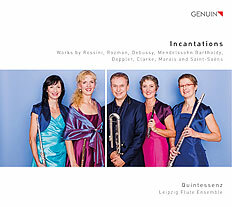 With their third GENUIN CD, Quintessenz is once again treating us to the magical sounds of the flute. And the title “Incantations” also has magic in store for us – fairly-like, moonlit, tarantula-inspired music from other spheres by composers including Mendelssohn-Bartholdy, Rossini, and Saint-Saëns. And the recording features no less than two world premiere recordings of works dedicated to the ensemble. With five flutes sounding like a whole orchestra, we can’t help but wonder if there’s sorcery going on here. "virtuoso combination of gorgeous playing!"